Today I'm going to show you all a nail art that you can do at home which requires zero practice. All you need to do is to apply you nail polish like how you always do. You need 2 colors of nail polish. I choose Bloop H516 (true red) and H506 (rusty gold) which I got from Fashion Culture Box's February Queen of Hearts and Queen of Fairies theme. You can use any other nail polish that you already have as long as it is one-coater and has full opaque finish. A top coat to seal the work. And lastly a manicure stripe tape. I forgot to include in the photo that you will also need a scissors to cut off the tape. The stripe tape that I have is really thin. It is about 1mm wide and it so easy to use. Step 1: Paint your nails with the lighter color of nail polish. Leave it to dry off completely. I leave it on overnight. 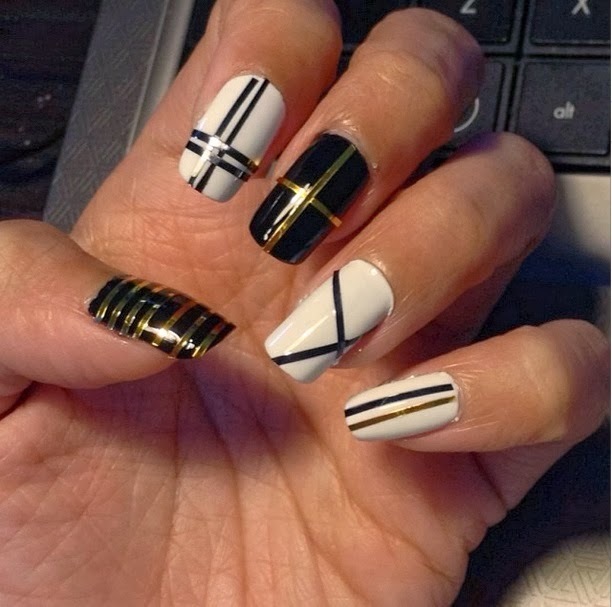 Step 2: Use the manicure stripe tape to create the lines you want. Leave the edge long enough for you to pull it out later. Step 3: Paint the darker color on top of it. Don't worry if you make a mess. You can clean it out with Q-tips or brush dipped in nail polish remover when you're done. Leave it to dry about 50% and then remove the tape. Lastly, apply top coat. And if you're too lazy to paint so many coats of nail polish, just paste the tape on top of you manicure and secured it with top coat. I posted this last two weeks on my instagram (do follow me @queenjerine). Do you girls want to learn how to create Tiffany & Co nails with the same technique? If yes, comment below. If there's request then I will post it up. P/S: If you're interested in getting the manicure strip, do email me. There are 3 colors - gold, black and white. wow got nail strip, where to buy? Love your nails so much!! And the design is super elegant! !